Security Tags are a simple solution for marking property and preventing theft. The thief will in most cases move on to an easier target as the aim for the thief is to resell the stolen item. For many years Laptops have been an easy target for thieves. Now with the increase in tablet sales throughout the UK the market for reselling stolen equipment has become even bigger. These Security Tags can be customised with the owners details. However due to manufacturing advancements, measures to safeguard laptops has become somewhat easier. 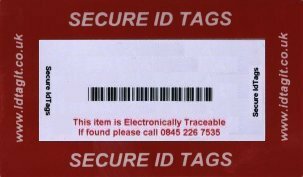 Using security tags, an individual can mark the equipment with owner information, making the resale of the stolen laptop more difficult. Security tags are one of the easiest ways through which a person can add user identity to a laptop, notebook or tablet. The tags are usually made from plastic or metal. They are glued to the laptop using a strong security adhesive which makes the tag almost impossible to remove and if removal is possible then the adhesive should still be left on the item. Some have reversed tattoos that leave a message on the item making resale extremely difficult. Etching alongside Security labels is another successful way of marking items.